You are here: Home / Givi Product Focus / Back Rests / Scooters! 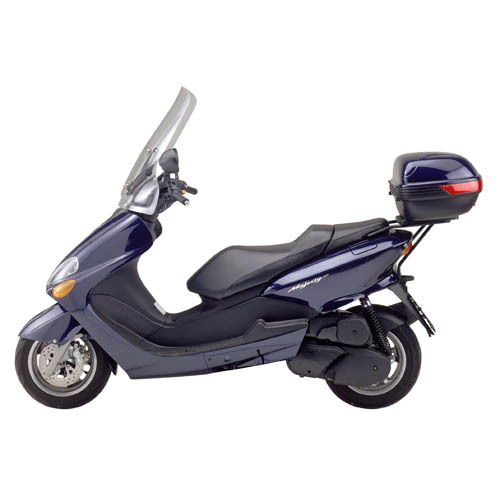 – Yamaha Majesty 125-150, 01-09. The Yamaha Majesty scooter consistently gets great reviews for it’s comfort, quietness and handling. Givi support this bike with both the Monolock and the Monokey range. The Majesty needs either a corresponding Monokey plate for Monokey Top Cases, the SR46, or the SR46M, which is designed for Monolock top cases. Click here for the differences between Monolock and Monokey in case you don’t already know. The nice thing about both the SR46 and the SR46M plate kits are that the Monokey includes the plate M5 with it, and the SR46M kit utilises the plate that comes with any Monolock box. Essentially there isn’t anything else you need to buy apart from the top box in order to get going! There is also a replacement screen called the 130DT, it is only available in the clear, transparent style and measures 69.2cm x 68.2xm (HxW). In order to fit this screen you require the D130KIT. Finally there is a back rest available for pillions, the TB46. In addition to the hard luggage Givi make a scooter tunnel bag which I have done a write up here for you.